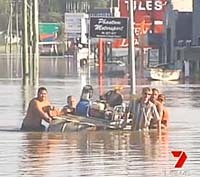 Ric Carter and Craig Dyer of Seven News discuss challenges of Brisbane floods. Brisbane, Australia, 10 February 2011: Newsmen in Australia have never known a year start quite like this one. Severe flooding in Brisbane and a destructive cyclone have tested TV news organisations to the limit. As with so many other things, when covering news you sometimes need to get lucky. And Channel 7 did. 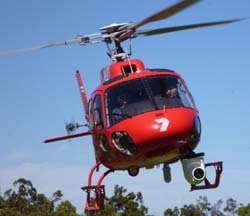 Just a month before the floods began, they took delivery of a new camera system that was installed underneath their news helicopters which greatly enhanced their newsgathering capability. 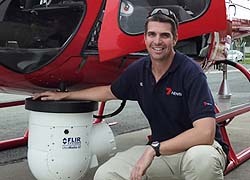 Craig said, “In the past what we’d do is put a cameraman sitting with his feet outside the helicopter shooting off the shoulder. But it’s very hard to keep a steady picture over a long period of time; in fact, you can give the viewer a bit of sea-sickness because the image can be very wobbly if you’ve got bad weather conditions. Whereas the new Flir UMHD system is a self-contained camera unit positioned underneath the aircraft; it’s got gyros that keep it stable and it’s got twice the length of lens that we’d have on a normal camera. So the camera operator can now sit inside the safety of the aircraft and operate the camera with a viewfinder and joystick. He can zoom in while the aircraft is moving." The other newsgathering tool that proved invaluable to covering the story was amateur video. Craig explained, “The big difference to 1974 [a previous flooding disaster in Brisbane] was that we didn’t have to rely on getting all the video ourselves. Some of the greatest stuff came from viewers who rang us and said ‘Hey, I’ve got this great stuff, can I send it to you by email or phone or SMS, or can I put it on YouTube.’ Sometimes we’d take it off YouTube or give them a server address and they’d FTP it to us.” A producer constantly monitored the internet for amateur footage, sometimes using several short clips a day. Craig said the era of the amateur video journalist has greatly enhanced TV news coverage: “Even going back to Cyclone Larry we had a person videoing from under a mattress and just saw this whole roof tear back and blow away." Comment: I saw C7's coverage of the cyclone and was impressed how they used Skype vision to send back pictures from a moving vehicle on the way to Tully, while the reporter was giving a live commentary. As far as I know you can't use an IPhone for Skype Vision (although you can for audio). I have discussed this with a number of people and nobody has an answer. Can anybody from C7 shed light on this? Roger Maynard, Aimsmedia.